The ecological constraints model predicts that daily travel distance and home range size of social animals will increase as group size increases in order to meet the dietary needs of additional group members. This theory has been supported more predominantly by studies of frugivorous primate species than by studies of folivorous species. 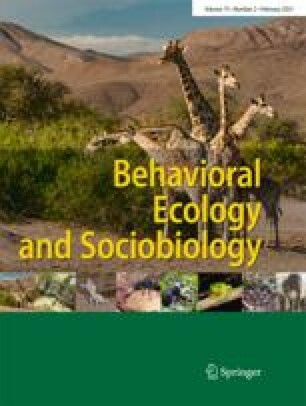 We examined the ranging patterns of mountain gorillas in Bwindi Impenetrable National Park, Uganda, who include both herbaceous vegetation and fruit in their diet, to determine how ecological, behavioral, and social parameters influence movement patterns. Data were collected from three groups of gorillas with overlapping home ranges at a low-altitude location (1,450–1,800 m) and one group at a high-altitude location (2,100–2,500 m) in Bwindi from September 2001 to August 2002. We analyzed daily travel distance and home range size in relation to group size, while also considering patterns of frugivory, rainfall, and location (proxy for food availability) within the park. Both daily travel distance and home range size were positively related to group size. In addition, the degree of frugivory positively influenced daily travel distance and home range size, while rainfall negatively influenced daily travel distance only. Finally, groups at the low-altitude location, with higher fruit availability, traveled less than the group at the high-altitude location. These results demonstrate that mountain gorillas in Bwindi provide support for the ecological constraints model, but further studies are needed to determine how fine-scale spatial and temporal availability of food resources influence movement patterns. Ranging patterns of Bwindi gorillas are compared to those observed in other gorilla populations in the context of the ecological constraints model. We thank the Uganda Wildlife Authority and the Uganda National Council of Science and Technology for permission to conduct this research. This work would have been impossible without the hard work of the following field assistants: Philemon Agaba, Nkundah Fred, Emmy Gongo, Nkwasibwe Champion, Rukandema Purinari, Tukamuaabwa Benon, Barugahare Herbert, Twinomujuni Gaad, Tibenda Emmanuel, Mbabazi Richard, Ngambaenza Caleb, Kyamuhangi Narsis, Byaruhanga Gervasio, Tumwesigye Philimun, and Murembe Erinerico. Additional thanks go to Alastair McNeilage and the Institute of Tropical Forest Conservation for logistical help throughout the study, Beth Kaplin and John Bosco Nkurunungi for assistance with implementing this project, Julia Lehmann for assistance with Arcview, Daniel Stahl for statistical advice, and Christophe Boesch for his support of this project. We thank Brenda Bradley, Julia Lehmann, Daniel Stahl, Lynne Isbell, David Watts, and one anonymous reviewer for constructive and useful comments that improved the quality of this paper. This research was funded by the Max Planck Society.